Preheat oven to 220°C. Grease and line the base of a 20cm round spring-form cake pan with non-stick baking paper. Melt the chocolate, golden syrup and butter in a bowl over a saucepan of gently simmering water. Set aside to cool slightly. Place eggs and sugar in the bowl of an electric mixer or use an electric hand beater and beat on high for 10 minutes until very thick and pale. Gently fold in the flour then fold in the chocolate mixture until combined. Pour into the cake pan and bake on the middle shelf of the oven for 12 minutes. Remove from oven and run a knife around the edge of the cake. Remove collar from cake pan and transfer the cake to the fridge for 1 hour to cool (this step is important as it sets the middle of the cake). Meanwhile, to make the coffee mascarpone, dissolve coffee in 1 tablespoon of boiling water and set aside to cool. Beat together the mascarpone, coffee and sugar in a bowl until stiff. To make the chocolate leaf, brush non-toxic leaves with the melted chocolate. When cool, peel the leaf off. 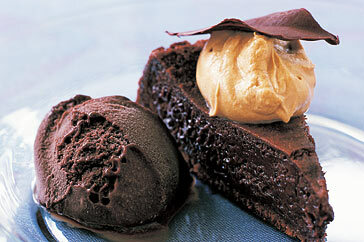 Slice the cake and serve with a dollop of coffee mascarpone, a chocolate leaf on top and a scoop of sorbet on the side. 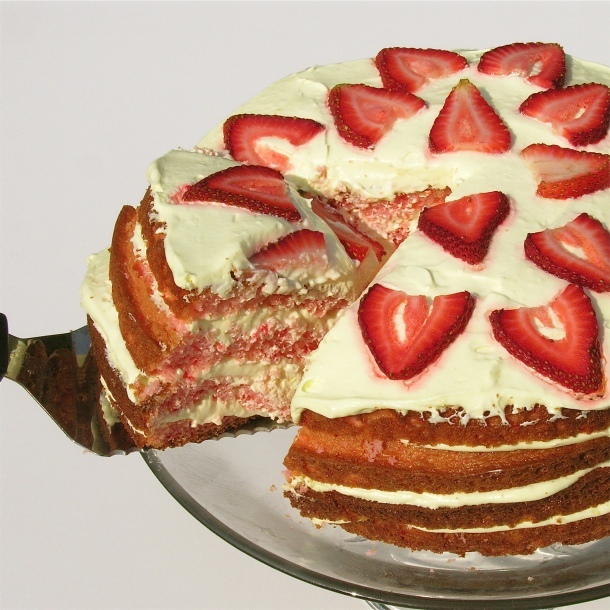 Moist strawberry cake layered with a rich lemonade cream filling. 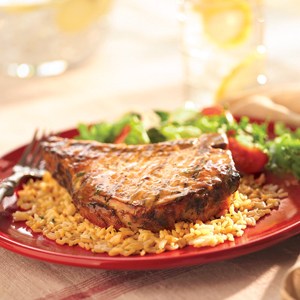 Introducing summer——on a plate! Mix marshmallow creme in and then mix in Cool Whip until completely smooth. Refrigerate until cake is cooled and cut. 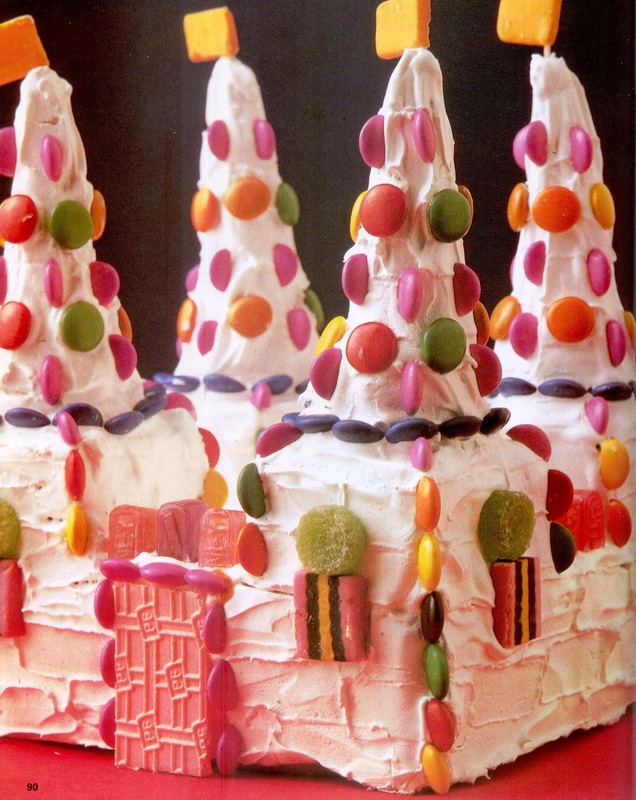 You will need lolly-pop sticks for this recipe and a block of oasis or polystyrene. Icing flowers are available from cake decorating supply stores, supermarkets and kitchen supply stores. Preheat the oven to 180C. Grease and line the base of a 20cm round (base measurement) cake pan with baking paper. Make the vanilla butter cake following packet directions. Spoon into the prepared pan and bake for 40-45 minutes or until a skewer inserted in the centre comes out clean. Remove from oven and set aside for 10 minutes before turning onto a wire rack to cool completely. Use a serrated knife to trim the crusts of the cake. Break the cake into small pieces and transfer to the bowl of a food processor. Process until fine crumbs form. Transfer to a bowl. Add the vanilla frosting and stir to combine. Line an oven tray with baking paper. Roll tablespoonsful of cake mixture into balls. Place on the lined tray. Loosely cover with plastic wrap and place in the fridge for 1 hour or until firm. Place the white chocolate melts in a heatproof bowl over a saucepan half-filled with simmering water. Stir with a metal spoon until chocolate melts. Add pink colouring and stir to combine. Dip the end of 1 lollypop stick in chocolate then insert into a cake ball. Return to the tray. Repeat with remaining cake balls. Dip 1 cake pop into the melted chocolate, turning to coat. Gently tap on the side of the bowl to remove excess chocolate. Insert the cake pop in the polystyrene to stand upright. While chocolate is melted, decorate with icing flowers on top and around the cake pop. Repeat with remaining cake pops, chocolate and icing flowers. Set aside for 30 minutes or until chocolate is completely set. Make cakes together according to directions on packet, spoon one quarter of combined mixture into greased 25cm x 8cm (10in x 3m) bar tin, spoon remaining mixture into greased deep 20cm (8in) square cake tin, bake in moderate oven 30 minutes for bar cake, 1 hour for square cake or until cooked when tested. Turn on to wire rack to cool. 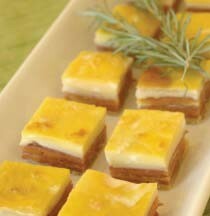 If necessary, trim tops of cakes to give flat surfaces. Place square cake on prepared board; cut bar cake into four equal pieces, position one piece on each corner of square cake, place an upside-down icecream cone in each corner. Cover cake and cones completely with Fluffy Frosting. Remove striker sides from matchbox cover, press one end lightly into frosti ng to form brick pattern. Decorate cake with assorted sweets, icecream wafer represents door, squares of soft fondant sweets on toothpicks represent flags on turrets. Make cakes according to directions on packet, pour into greased deep 23cm (9in) square cake tin, bake in moderate oven 75 min or until cooked when tested. Turn on to wire rack to cool. 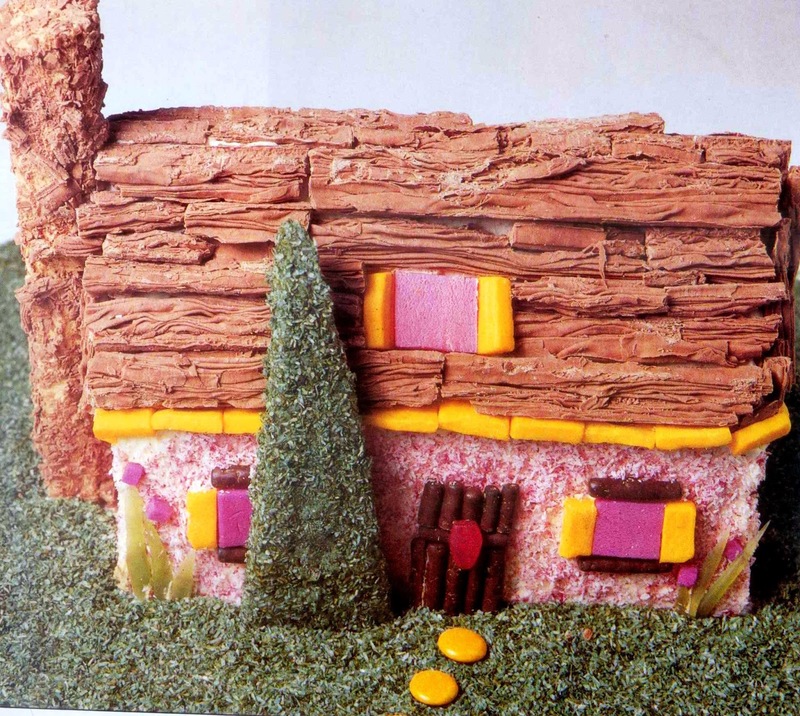 Cut cake in half vertically, trim one half to form roof, cut out chimney and tree from trimmings, assemble cake on prepared board. Cover house with Vienna Cream. Tint 1.5 cups coconut with a few drops pink food colouring, tint remaining coconut green. Coat walls with pink coconut. Make windows. 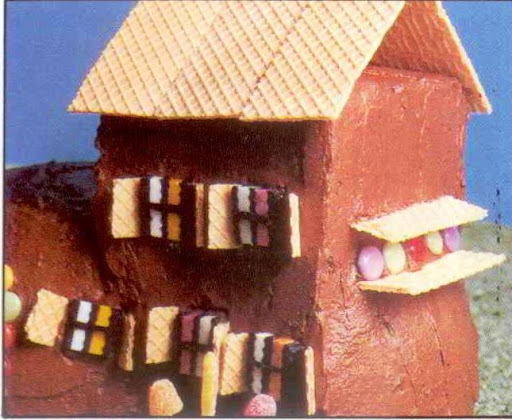 gutters and doors out of small sweets and licorice strips.Cut Flakes into various lengths, place on roof, leaving a small space for window, fill in window with small sweets. Ice chimney with Vienna Cream, coat in Flake crumbs, place on side of house. 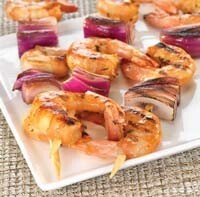 secure with small wooden skewers. Ice tree with Vienna Cream, coat in green coconut, position near front door. Small sweets and jubes represent flowers: spread remaining greentinted coconut around house, small round sweets represent garden path. Whisk together flour, baking powder, baking soda, 1/3 cup white sugar, and salt in a mixing bowl. Stir in buttermilk until the flour mixture is moistened. Drop 1/3-cup scoops of the dough 2 inches apart onto the prepared baking sheet. Brush biscuits with heavy cream and sprinkle generously with turbinado sugar. 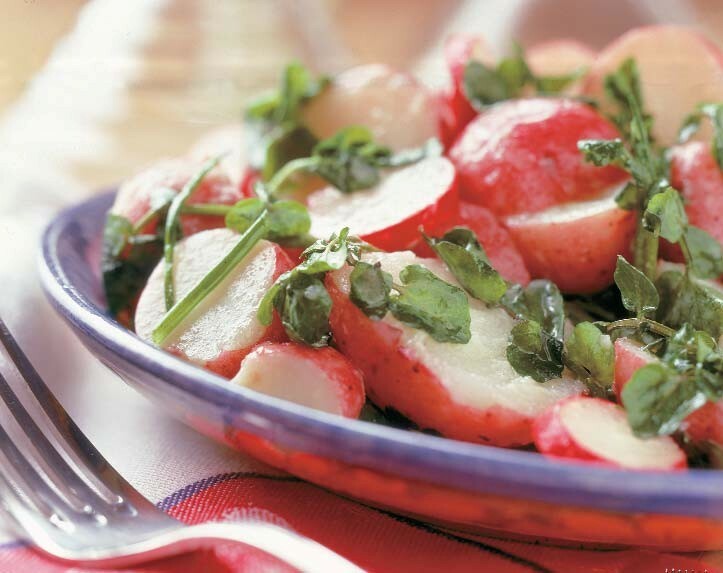 Mix together the sliced strawberries, 1/4 cup white sugar, and lemon juice in a large bowl. Allow berries to rest until juices develop, about 30 minutes. Serve the strawberries with juice over the biscuits. Make cakes according to directions on packet, spoon one third into greased 2 litre (8 cup) pudding basin, spoon remainder of mixture evenly into two greased 23cm x 12cm (9in x 5in) loaf tins, bake in moderate oven 55 to 60 minutes for pudding basin, 50 minutes for loaf tins or until cooked when tested. Turn cakes on to wire rack to cool. 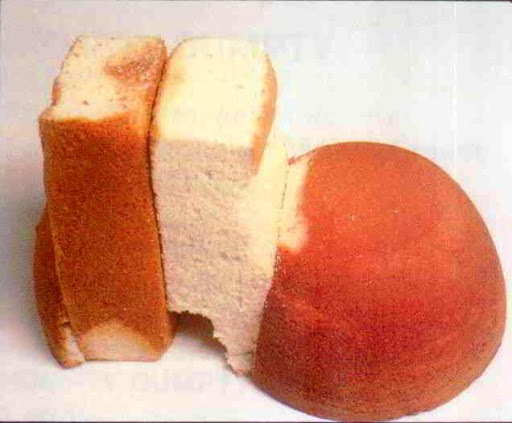 Cut 5mm (1/4in) slice off one end of pudding basin cake (cut-off piece forms heel of shoe, the rest forms toe), stand loaf cakes upright behind toe, as shown; if necessary, trim sides and tops of loaf cakes to make them even. Place heel in position, stick a long wooden skewer through heel to toe to hold pieces in position. Cut a curve in top end of cake directly behind toe, as shown, to form shoe opening. Cut a curve out of base of same cake, as shown, to form arch of shoe. Cover cake completely with Vienna Cream, place ice cream wafers on top of cake to form roof. Cut licorice all- sorts in half lengthwise, place narrow strips licorice across centres, press all sorts around cake to form windows. Cut shutters from ice cream wafers, place on either side of windows. 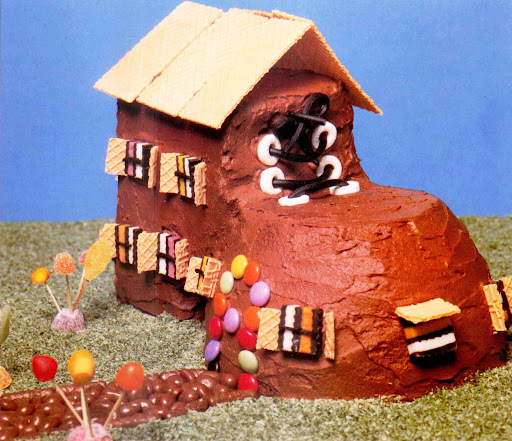 Make door from small sweets, path from chocolate-coated sultanas. Life- savers represent eyelets; join with licorice strips to make laces, press licorice bow above laces. 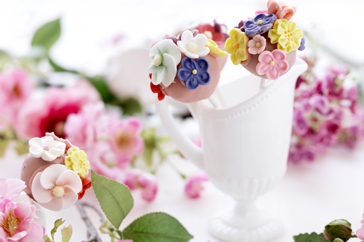 For flowers, press toothpicks into round jubes, then press coloured soft sweets on other ends. Back window is made with ice cream wafers and small sweets.